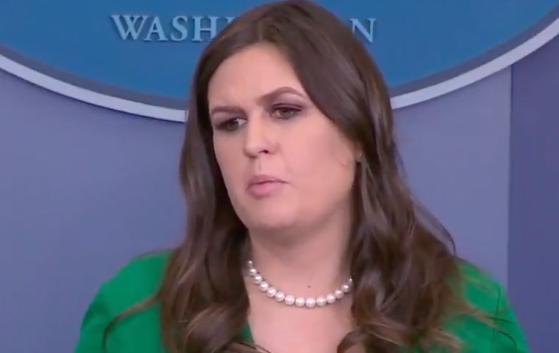 White House press secretary Sarah Sanders took a page out of the alternative media playbook Friday, turning the discredited Trump-Russia narrative upside down and revealing to the entire world what alternative news outlet like this one have extensively reported – The only documented collusion in the 2016 election was between the Clinton-DNC Machine and Russia. Much to the chagrin of the deep state and their establishment media puppets, Sanders seemingly referenced recent reports that proved that the Clinton funded “Russia dossier” was chalked full of disinformation from Russian sources themselves. “We think that we are continuing to see day in day out as this investigation moves to completion that the same as this started, there is still no evidence of collusion between the president and anyone,” Sanders responded after being asked whether the president supported calls for Robert Mueller to step down. “Sanders declined to answer a follow-up Friday asking what evidence President Donald Trump has to accuse Hillary Clinton of colluding with the Russians,” wrote CNN. This is classic propaganda. CNN is an extremely well-funded “news” corporation with a plethora of resources. Evidence of Clinton-DNC collusion with Russia has been reported on extensively over the last two days. It is highly unlikely that CNN is unaware of the proof that they are pretending to seek. Regardless, for those who may have missed the reports and for CNN’s Jeremy Diamond (who is apparently clueless) the evidence of collusion comes from statements made by Christopher Steele himself as well as reporting on the dossier that openly discussed where the salacious details came from. Amazingly, CNN didn’t just pretend that they hadn’t seen the proof of Clinton-Russia collusion, their reporter, Jeremy Diamond, went as far as to straight up lie with his outlandish claim that the dossier wasn’t a part of the basis for the entire Russian Trump narrative itself. “The dossier is not the basis for the FBI’s investigation into allegations of collusion between the Trump campaign and Russia,” Diamond falsely reported. This is transparent nonsense as numerous media reports have already revealed that the dossier was taken very seriously throughout the FBI and that despite his public statements, Comey heavily investigated it before his firing. The FBI not only paid for the dossier in a roundabout way, the dossier was actually used as a basis for wiretaps on American citizens. In March, Washington Post used anonymous sources to report the FBI obtained a secret court order last summer to spy on U.S. citizen Carter Page, an unpaid and informal adviser to the Donald Trump campaign, as part of an investigation into links between Russia and the Trump campaign. CNN used anonymous sources to report that the infamous “golden showers” dossier was used as part of the justification to win approval to monitor the Trump associate. A Clinton campaign opposition research operation using information or disinformation from top Russian intelligence officials was used by the FBI, these sources say, to enable spying on an opposing political party’s campaign. Let that sink in for a moment. CNN has directly claimed that the dossier has no basis in any investigation when in reality it was literally used to spy on American citizens and was so important that the FBI went out of their way to obtain it. And who were the sources for the dossier?